At the beginning of the Sangamon inter-glacial stage (Wicomico time) when the Floridian Plateau lay beneath water 100 feet deeper than the present sea level, a coral reef began to grow on the southeastern edge of the Plateau. 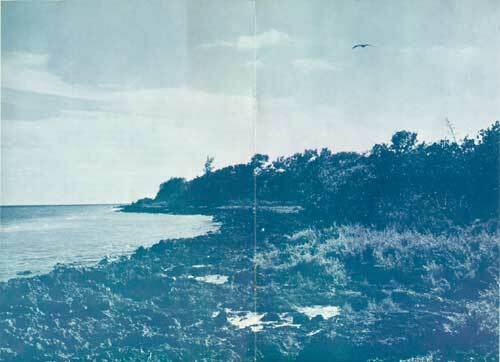 By Talbot time, the sea had dropped to about 40 feet above its present level, a depth favorable for the growth of coral reefs, and the Key Largo limestone reef grew upward until it was within 20 or 25 feet of the surface, perhaps less. Meanwhile, the Miami oolite was accumulating in the shallow water behind the reef. When the sea fell during the Wisconsin glacial stage, the coral reef died. It was submerged again briefly during the mid-Wisconsin recession (Pamlico time), but soon emerged and has since remained above water except in the low passes between the present Keys. The emerged coral reef forming the seaward shore is composed of Key Largo limestone containing coral heads in their original position. Coral-bearing Key Largo limestone is used as building stone. Although quite hard, the limestone contains so many cavities that crushed stone may occupy less space than the original rock. Because the surface rocks of the mainland contain almost no quartz, they have yielded little sand for the seashore. Very little sand has drifted southward along the coast beyond the entrance to Biscayne Bay. As a result, the ocean shores of Elliott and Rhodes Keys are mostly rough coral rock with very little sandy beach. Only on Sands Key are there good beaches of any size. 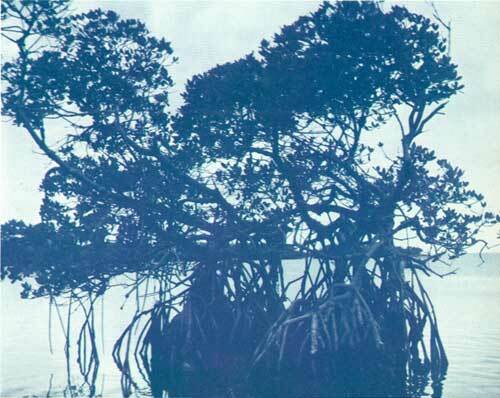 The flora of the Florida Keys includes a number of species not found on the mainland. These species are supposedly carried in from the West Indies by the Gulf Stream which flows northward just off the coast. Woody vegetation covers the keys almost completely. Red, white, and black mangroves, occupying from one-fourth to one-third of the total area, cover the western side and all land subject to tidal overflow. Tropical hardwoods dominate the higher central portion of these keys and come down to the ocean shore except in the lower places where mangroves border the shoreline. Most of the tropical hardwood growth is 20 to 40 year-old second growth that followed cultivation or fire. Only very small areas of the original forest remain here and there, but even so these Keys are reported to have the best remnants of the once splendid tropical forests of South Florida. Some few large mahoganies, vestiges of the fine stands cut for ship building over the past 200 years, still exist on these islands, especially on Sands Key. 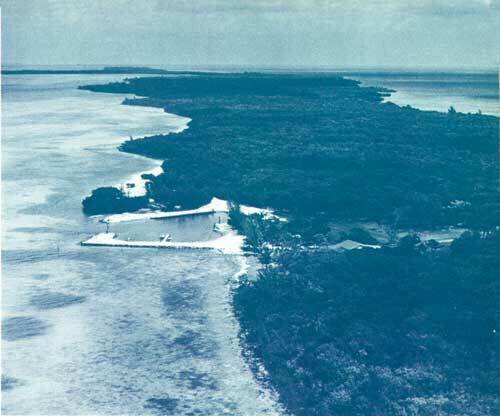 Rhodes Key has the largest proportion of undisturbed hammock while the woody vegetation on Totten Key is principally mangroves, as is the case with the other smaller Keys. Among the plants of interest is the Hog Palm or Sargent Palm (Psuedophoenix vinifera). This close relative of the Royal Palm, once abundant on Elliott Key, was for some years thought to be exterminated but recently has been seen again on Elliott Key. Other trees of interest are Red-Berried Eugenia (Eugenia confusa), Torchwood (Amyris elemifera), Joewood (Jacquinia keyensis), Seven-year Apple (Casasia clusiifolia), and Jamaica Dogwood (Ichthyomethia piscipula). The Australian Pine also occurs on the islands, having been introduced by winds and birds. However, if indigenous vegetation is to be preserved, this exotic weed must be eradicated. A number of land and sea mammals are present. The racoon and opossum have been observed, as well as that interesting creature, the manatee, which frequents the creeks of the Keys and feeds on the grass flats of Biscayne Bay. Except for marine life, birds provide perhaps the most interesting animals to be seen. Elliott Key may be the northern breeding outpost for such West Indian species as the White-Crowned Pigeon and Cuban Golden Warbler. Some of the rare speciesmuch in need of protection wherever they occurinclude the Reddish Egret, Swallow-tailed Kite, and Short-tailed Hawk, each of which may have small breeding populations in the area. In general, the ecology of the Keys does not favor an abundance of water birds because wetlands are limited except for the dense mangrove swamps. The one exception is the wide tidal mud flat between Old Rhodes Key and Totten Key which seems to be a productive feeding ground. The northeastern island of Arsenicker Keys appears to be the nesting place of most of the colonial water birds that feed on these flats. The Arsenicker Keys-Old Rhodes Bight area apparently is an ecological unit as far as water birds are concerned. Of most interest in conservation of rare reptilian species is the probable occurrence of the American Crocodile and several species of sea turtles. In addition to three Atlantic species of sea turtle (Loggerhead, Ridley, and Leatherback), almost certainly the Atlantic Hawksbill and, more rarely, the Atlantic Green Turtle occur in the proposed area. The scarcity of broad sand beaches, however, make this an unlikely sea turtle nesting area. In the past, the range of the American Crocodile included Biscayne Bay. In fact, as recently as two years ago this beast was still to be found on northern Key Largo at a point some seven miles below the southern boundary of Dade County. Definite records are wanting, but scientists consider it likely that the crocodile occurs in the maze of islands and waterways around Caesar Creek and Broad Creek. The numerous keys present a varied series of habitats for marine life. The bay side of the keys is typically marl mud with marine grasses forming dense meadows which are the principal nursery grounds for shrimp, spiny lobsters, and many marine game and food fishes. Also numerous outcroppings of the limestone afford a settlement for numbers of sponges, many of commercial value, although now largely unexploited. On the seaward side of the Keys the shore is low, usually rocky with bottom shoal and covered with corrallines, small cluster corals, algae, and marine grasses, but more rapidly deepening than the bay shore and exposed to moderate wave action. Coral linaceous rock outcrops covered with low coral growth and seafeathers, sea whips, and sponges usually occur a few yards offshore. Numerous fishes and spiny lobsters frequent this area. The corals are formed by millions of tiny, soft-bodied, colonial animals, depositing lime secreted from their bodies. Except for brain corals, which are massive, the stony skeletons are fragile even when alive. In this, the northernmost range of corals along the Atlantic Coast, they live perilously, sometimes being torn up and overturned by hurricane seas. 1. Pastures of turtlegrass where one can find thirty-two different kinds of starfish alone and six species of sea anemones. Here also are curiosities like the sea cucumber and the sea hare. 2. "Hard pan" bottoms where forests of sea fans, sea whips, and giant sponges grow. 3. Miniature reefs and coral heads which include a number of delicate, shallow water forms. 4. The dark, still water under the mangrove labyrinth a fantastic marine nursery. On the west side of Elliott Key, near the County Park, these four communities can be found in miniature in two or three feet of water, each one only a few yards from the other. Through the medium of a face mask and snorkel tube even young children can safely enter this shallow underwater fairyland of brilliantly colored tropical fish. They thrill to the sight of young shark and barracuda that look big underwater but actually may be only eight or ten inches long. From beneath the surface, a ten inch limestone cliff, complete with caverns full of snapper, lobster, and parrotfish, looms as large and mysterious as Captain Nemo's caves. Adults are no less thrilled than children at these amazing underwater sights. Between the Keys are various passes or creeks, as they are locally termed, some of which are fairly wide and shallow, and some narrow, only a few hundred feet wide, but deep, twisting, down to 25-30 feet in crystal clear water. These creeks are the haunts of teeming thousands of fishes which live among the corals, sponges, and sea-feathers on the bottom. Here one finds such fishes as groupers, snappers, jewfish, Spanish hog fish, barracuda, yellowtails, and many others. Over 250 species of marine fishes occur along the shore.